Throughout 2015, the eyes of the world will be on Bristol as the European Green Capital – the first UK city to win this prestigious award. Towards a healthier, happier city. We won not just because of our plans for the future, but because of the city-wide efforts Bristol people and businesses are already making towards creating Britain’s most liveable city. 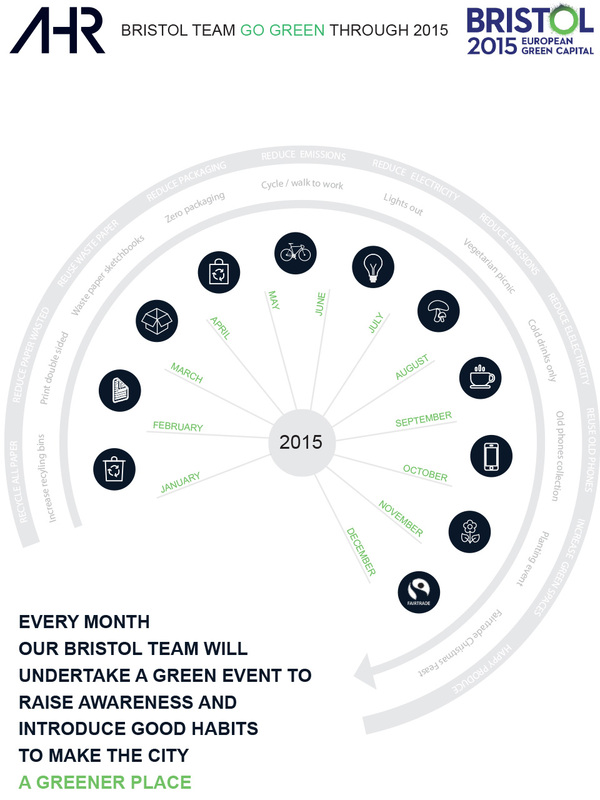 The team in our Bristol office will be contributing to the city's environmental efforts throughout 2015. They are dedicated to making the city and region a low carbon environment with a high quality of life for all. In addition to our environmentally aware building designs AHR are planning a series of activities to raise awareness and change behaviours. These include new challenges each month targeting various aspects of sustainable living at work and home. Monthly themes range from recycling, reducing plastic waste, the use of Fair Trade produce and the reduction of our own energy consumption.